Rockets, Rockets and more even more Rockets. When it comes to local multiplayer, the Nintendo Switch has a lot to offer. There are a lot of unique experiences that all have their very own unique gameplay styles and artistic approach; ROCKETSROCKETSROCKETS is one of these games. It’s streamlined multiplayer gameplay offers a very simplistic, yet interesting approach to the Switch’s library and is something me and my friends found wanting to play over and over. It’s not too full of content, but the content that is there is enough to keep you and a group of buddies entertained for a couple of interesting hours. ROCKETSROCKETSROCKETS is a pretty self-explanatory game. It’s about rockets. The gameplay is built around shooting rockets with your rockets, and while the gameplay does sound extremely basic, the simplicity is where the game’s fun stems from. There are multiple different game modes that allow you to play in many different ways, but most, if not all of the modes are best suited for local versus matches. While the game does have options to play against the AI, ROCKETSROCKETSROCKETS’ fun and intensity comes from sitting on a couch with friends and feeling the nostalgic, yet fast-paced rush of arcade arena action. Gameplay in ROCKETSROCKETSROCKETS feels fluid and smooth, the game involves very little button inputs and that’s why the game’s simplicity doesn’t feel forced or empty, you have three main attacks and a shield in your arsenal, which once learnt inside-and-out, can be used very strategically and fun during versus matches with friends. You have the option of normal bullets, carpet-bomb-styled missiles that are affected by gravity and a trail of landmines you can leave behind you in succession. Along with the shield for perfectly timed parries or collisions, the simple arsenal of weapons allows new players to pick up and understand fairly quickly, while still allowing some wiggle room for those more serious players to set up some great battles. There are many different rocket-types to choose from, each rocket has their own spread of stats between damage, turning and speed, and because of this, finding the rocket that best suits your playstyle can be a fun experience and allows various ways for the game to be played. I found my and my friends to switch rockets in between matches, as it stopped the game from becoming too repetitive in the long run and allowed us all to test how good we were at the game while utilising completely different fight-styles. 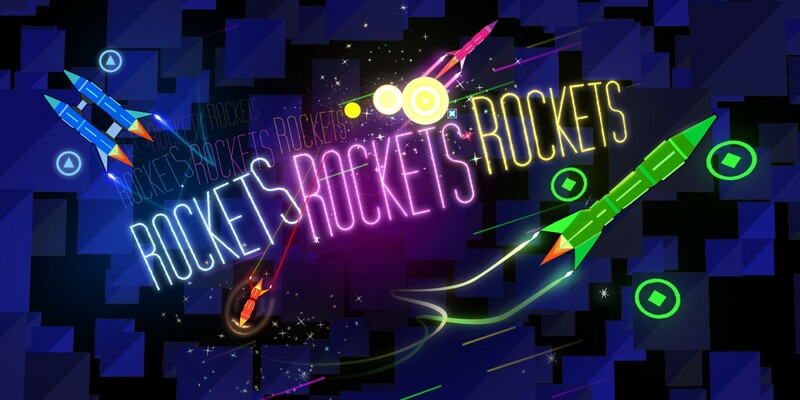 ROCKETSROCKETSROCKETS features a number of various modes, firstly, gameplay modes can be changed within the settings. Bubble mode is similar to Balloon Battle from Mario Kart, where you start with three bubbles and once an opponent pops it, they gain it. The last person standing wins. Tug O’ War mode is a team-based game mode where you obtain and hold the lead until the timer runs out. Both of these modes are fun and different enough to be able to create some variety within the game. Once a gameplay mode is picked, you can select the game type, here, you can choose one of six different maps, each of which have obstacles, their own power-ups and map layout. Once the map has been chosen, you can choose the type of game you want to play, Quick, Zen or Tournament. Quick Mode allows you to fight with two, three or four players in either a free-for-all or in team battles. Zen Mode is kind of pointless, it allows you to fly through a map with no obstacles or fighting and instead allows you to take in the ambience and draw pictures with your rockets. I don’t ever see myself playing this after playing it the first time as it’s just empty and kind of boring to play in, especially since your drawings disappear before they’re even finished. Tournament Mode allows you to set up a game with a score limit, game mode and players and allows you to set up more competitive-like games. ROCKETSROCKETSROCKETS’ art style is fun and vibrant. It mixes the darkness of space with the bright neon colours of your rockets and their weapons. The contrast allows your rockets to be fairly visible while playing, while also having its own unique aesthetic and quirkiness. The soundtrack for the game fits extremely well with the usually fast-paced matches and the vibrant colours, it’s electronic and involves a lot of synths. It’s futuristic and very sci-fi-esque and fits well with the game in general. If the soundtrack was sold separately I would definitely spend a few bucks on it. Within the game, you can find an extremely in-depth settings menu where you can tweak gameplay, power-ups, visual aspects such as bloom, sprite sizes and trail thickness, as well as a miscellaneous menu where you can allow up to four controllers to control a single rocket for fun, co-op gameplay, as well as gravity modifiers, to change the physics for a more hectic match. Even though settings menus are usually not something I’d touch on within a video game, ROCKETSROCKETSROCKETS utilises a very in-depth one that allows for a metric ton of customisation, allowing for some more variety within matches. All in all, ROCKETSROCKETSROCKETS is a great addition to the already expanded Multiplayer game library for the Switch. It may not be too deep in terms of core gameplay and mode selection, and would be a lot more tempting if it had some sort of online interaction, but the game has substance a charm that my friends and I found hypnotising us for a couple of hours before it got repetitive. It’s a cheap pickup and definitely worth it if you’re looking for a batch of small, quick versus matches on-the-go.